Esther Mwende Macharia is one of the most bankable media personalities in the country today. Besides hosting one of the most popular radio shows, Mwenda also boasts bags of experience on television. In your own words, who is Mwende Macharia? A bold, ambitious, interesting, fun and sassy media personality. That I am very kind-hearted. How did you kick off in the media industry? I was a volunteer at a rehabilitation centre called Teens Watch while in college in Diani. I would also get Emceeing gigs then, and this made me realise that I could do well on TV or radio. I started doing voiceovers while I was on my internship, and I finally got my first job on Sheki FM in May of 2009. How would you describe your journey since then? Very progressive, but not without challenges. I have had to put in a lot of work and time. Tell us more about Champs Foundation. It is very close to my heart because it is born out of one of my passions. I speak to almost 1.5 million young people every day through my show, and I realised that there is a gap. Many of them desire to succeed, but don’t know how to harness it from within them. We started pushing a campaign called ‘Najijua, Najiamini’ to make the youth more self-aware and self-identified. With that comes self-development, where we visit different schools to talk about. The foundation’s idea came in 2012, but we finally started in 2015 at my former primary and high school back in Diani. It’s an idea that came around as I was looking for a publicist last July. I thought about having an intern who would come and learn about the media industry from my nine years of experience. We spread the word, had applications sent and narrowed down to an intern every three months. I felt it was good to share my experience with young people, and this should be done in other industries as well. 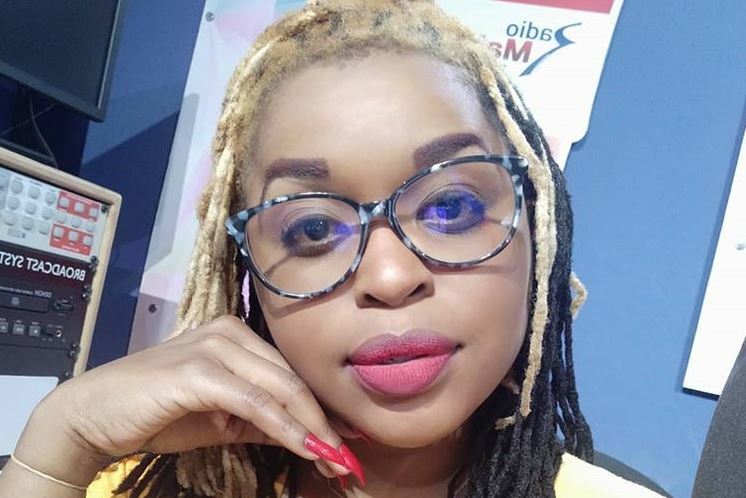 Emily Mbai, a radio and TV personality, is Mwende’s first protégé. Did you ever imagine you would be where you are today? I always knew I would be great, but not to what magnitude. (Laughs). I love my hometown Diani and never planned on leaving. I was quite scared when I got a job in Nairobi just after working there for a year. But I reminded myself of my dreams and never wasted any time. I grew with it. Who would you say are the greatest influences in your life? My dad. Most of what you see in me, like my boldness, he made sure to instil in me. Other media personalities that I grew up watching have influenced me as well: Tyra Banks, Oprah Winfrey and Caroline Mutoko. It has to be the fact that I host one of the most listened to show on afternoon radio in Kenya. We have many radio stations in Kenya at the moment, and being able to get to be the first is not easy. If you weren’t a media personality today, what would you be? Nothing else honestly. (Laughs). This has been my dream while growing up. I think I was born for this. I want to see my brand having grown out into the continent, and maybe even the world. Yes, I am just a media personality, but I am also purposeful. I believe that God has called me to empower young people through media. I would love to work with organisations and to reach out to people in the same way. I have to be up early to personally ensure that my son gets into the school bus. I then go into my room, pray and read something. I eat breakfast after, and head to work to prepare for the show. Currently, we are planning on a TV show, so we have meetings with the producer right after the radio show. The protégé has to accompany me to all these meetings. I then head home to spend time with my son if I have no events to attend in the evening. My co-host and I have to be informed of all trending issues to do with the youth on that particular day. We also have to confirm guests for the show, as well as go to different sites. It has been amazing and very enlightening. I have been able to learn a lot, as well as create content. It has been eye-opening and mind-opening to bigger things in the industry which I never knew existed. What do you hope for after the mentorship? To have grown my skill set, confidence, network, and be a different and better presenter than I was. I want to take my career to the next level. I have already started working on a project with Standard Digital which will be launching soon.